Similar to the neighbouring populations in mainland China and Hong Kong, the Taiwanese have a strong affinity to physical gold, and view it as a store of value, a safe haven and a symbol of wealth. And similar to Japan to the north, Taiwan also has the distinction of having been a huge importer of gold in the late 1980s and early 1990s, and was even the world’s largest gold importer for a period in the late 1980s. Taiwan is therefore a mature gold market, but one where gold import volumes are now far lower than previously. In Taiwan, gold is still measured in the Taiwan Tael, with 1 Taiwan Teal = 37.5 grams. The system also uses a subdivision of a Tael, known as a cian, which is equal to 1/10 of a Tael, or 3.75 grams. Although the tael bar size is still popular, the 1 kilo bar size, as in most of Asia, is gaining ground as an investment bar standard. In the late 19th century and early 20th century, when Taiwan was under the occupation of the Japanese Empire, there was a famous gold rush and substantial gold mining in Jinguashi, which is located in present day New Taipei City. Nowadays, Jinguashi merely hosts a gold museum as a memorial to this historic gold rush. Another gold rush of sorts occurred in Taiwan in the late 1980s, itself a product of a prior historic era. When the government of Taiwan, Republic of China, was formed in 1949, gold was deemed a strategic commodity to be kept under government control, and gold imports were strictly monitored and gold exports were prohibited. Despite the restrictions, gold smuggling into Taiwan was prevalent, with much of the unofficial imports coming from nearby Hong Kong. Taiwan’s gold restrictions remained in place for over 40 years, until the Taiwanese Government began lifting some gold import restrictions in 1986. Before that, only one entity, called the Central Trust of China (see below), was authorised to import gold into the country. The lifting of gold trading restrictions beginning in 1986 seemed to tap into pent-up bullion demand, for in 1987, Taiwan officially imported 130 tonnes of gold, up from 27 tonnes in 1986, and then in 1988 imported a massive 350 tonnes of gold. In 1992, Taiwan’s gold market was further liberalised after the Government’s import licensing system and prohibition on gold exports were abandoned. In recent years, Taiwan’s gold imports have been far lower. For example, according to the World Gold Council, Taiwan imported 22 tonnes of gold in 2014, of which about 15.6 tonnes was for electronics and 4.5 tonnes for jewellery fabrication. Not surprisingly, as in most other Asian countries, some Taiwanese commercial banks are involved in selling gold and investment gold products. A prime example is Bank of Taiwan, which is the largest commercial Bank in Taiwan and which is state-owned through the Taiwanese government’s ownership of Taiwan Financial Holdings Corp, Bank of Taiwan’s parent company. Bank of Taiwan is also the clearing bank for the NTD in mainland China. Bank of Taiwan became closely involved in the Taiwan gold market following its merger with Central Trust of China (CTC) in 2007. Historically, CTC was the sole government appointed gold import agent into Taiwan, and after the import restrictions were lifted, remained as Taiwan’s leading gold wholesaler and distributor. Prior to its acquisition by Bank of Taiwan, CTC had supplied large 400oz gold bars and kilobars to jewellery and industrial users as well as smaller investment Swiss made bars (including Tael denominated bars) such as UBS branded bars and bars from the Argor-Heraeus refinery. CTC had also been the distributor for gold coins from major mints such as the Royal Canadian Mint, Perth Mint and Austrian Mint. Therefore, nearly all of the gold products and services offered by Bank of Taiwan today, including an unallocated gold savings plan that can be converted to gold, called the ‘Gold Passbook’, are the same products and services that were offered by CTC prior to the merger. 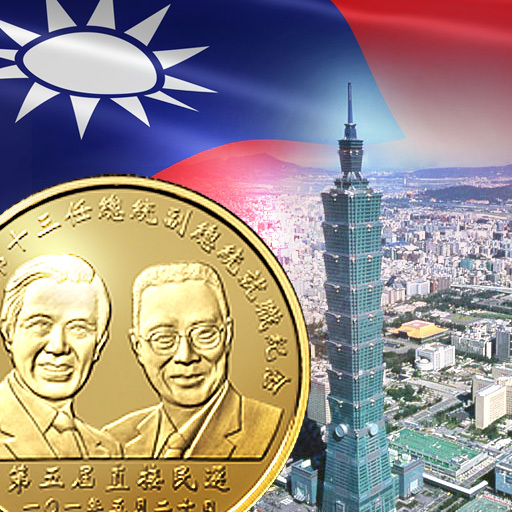 In 2012, Bank of Taiwan was also authorised by the Central Bank of the Republic of China (Taiwan) to distribute commemorative legal tender gold and silver coins which were issued to celebrate the inauguration of the 13th President of Taiwan. Another commercial bank involved in the Taiwanese gold market is Hua Nan Bank, which sells a range of gold coins and is a distributor for Perth Mint gold coins. Like Bank of Taiwan, Hua Nan Bank also offers a gold passbook savings scheme, either in NT Dollar (minimum 1 gram) or US Dollar (minimum 1 ounce) with the ability to buy, sell (convert to gold), or purchase through regular fixed additions. The Taiwan Futures Exchange (TAIFEX) lists a number of gold derivatives contracts. TAIFEX is a member-owned futures exchange established in 1997. The TAIFEX US dollar gold futures contract was launched in March 2006, the New Taiwan Dollar (NTD) gold futures in January 2008, and NTD gold options in January 2009. The NTD gold futures product was launched in 2008 to meet local investor demand. One unintended consequence of the NT Dollar gold futures launch was that trading volume in the US dollar gold futures collapsed due to a shift by trading participants to using the NTD contact. By 2012, USD gold futures volume had approached zero. The US dollar gold futures contract (GDF) only recorded 2 trades in 2015[fd. TAIFEX US Dollar gold futures trading volume 2015 http://www.taifex.com.tw/eng/eng7/AnnualTrading.asp], 1 trade in 2014, zero trades in 2013, and 36 trades in 2012. GDF trading collapsed in 2008/2009 when the NT gold futures contract was launched. NT dollar gold futures (TGF) volume was very high during 2008 and 2009, but its trading volume also dissipated from 2010 onwards. The TGF contract has relatively low trading volume, with only 58,000 contracts traded during 2015. The TGF contract is nearly exclusively traded by individuals and proprietary traders. For example, in January 2016, the TGF contract recorded trading volume of 7,550 contracts, of which 30.3% represented individuals, 66% proprietary traders, and 3.7% foreign institutional traders. SOLAR, the largest precious metals refiner in Taiwan, is the only Taiwanese gold refinery on the London Bullion Market Association’s (LBMA) Good Delivery List for gold. The LBMA has accredited the manufacture of SOLAR’s 400 oz Good Delivery gold bars, however SOLAR also produces a limited range of other gold bars including kilobars and 5 and 1 Tael bars. Taiwan’s central bank, the Central Bank of the Republic of China (Taiwan), holds the world’s 14th largest reported official gold reserves at 423.6 tonnes. Unusually for a major central bank gold holder, all of Taiwan’s central bank gold is stored in Taiwan, and none of the gold reserves are stored internationally. Like Taiwan’s gold rush at the turn of the 20th century, the gold rush of the late 1980s and early 1990s, where Taiwan imported vast amounts of gold bullion itself turned out to be a short-lived period of gold accumulation frenzy. But critically, most of that accumulated gold is still hoarded within the boarders of Taiwan. However, given its shared heritage with Greater China and greater gold trading ties with the PRC, the Taiwanese Government and gold sector must be looking on with great interest at the rapid development of the Chinese gold market, and the continued accumulation of gold by the Chinese populace, as well as by the People’s Bank of China.